Cleveland Cavaliers shooting guard JR Smith was diagnosed with a right fractured thumb Wednesday morning. He will undergo surgery and is expected to be out for at least 4-6 weeks according to ESPN’s Brian Windhorst. Smith suffered the injury in the first half of Tuesday’s game against the Milwaukee Bucks. It happened when he swatted down on Bucks forward Giannis Antetokounmpo. The initial tests were inconclusive but once the team returned to Cleveland to face Milwaukee Wednesday night, he was re-evaluated and tests revealed the fracture. 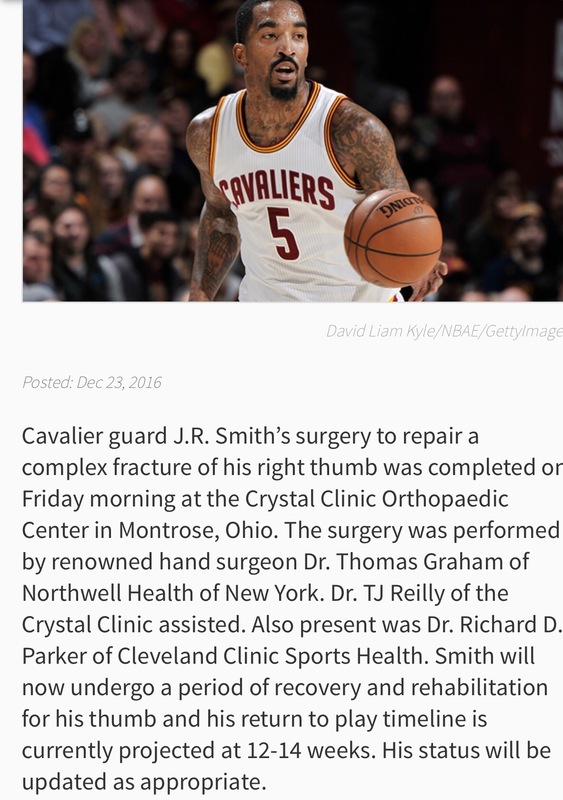 Smith signed a four year deal worth 56 million dollars with the Cavaliers in October after holding out since free agency opened. He’s played in 21 of the 26 games played this season, averaging 8.6 points per game and shooting 33.7% from the field and 36.2% from three point range. This is going to be a tough test for the Cavaliers without Smith. The depth in the backcourt is questionable. Outside of Kyrie Irving and Iman Shumpert, you have guys with very little track record in the NBA. Jordan McRae has 38 career games played and when he’s got the chance to play he’s struggled and looked lost on the floor. His contract becomes guaranteed in early January so if the Cavaliers want to dump his contract to add a player who can contribute, they will. DeAndre Liggins only has 75 career games played but he’s held his own when given an opportunity especially over the last few weeks when Smith was out with ankle and knee injuries. The Cavaliers have been shopping injured players Mo Williams and Chris Andersen in trade talks to try to open roster spots. They might have to throw in more to get those contracts off the roster so they can add some players. They also have a large trade exception obtained in the Anderson Varejao/Channing Frye trade that they could use once roster spots open up to add some talent and bench depth. General Manager David Griffin has been known to make some pretty unbelievable trades so I’m sure he’s got some magic up his sleeve to upgrade the roster. With that projected timetable of Smith’s absence, he’s expected back by late March-early April and should be ready to go for the postseason. The team may need to go make a move quickly to fill the void so that the team can maintain their spot as the number one seed in the Eastern Conference.